The People vs. George Lucas is a surprisingly lively documentary that doesn’t simply compile a bunch of diatribes from disgruntled fans. While those rants are most definitely a factor, there’s a larger question up for debate here: Does an artist have the right to change a piece of work once it’s been released to the public? More to the point, does George Lucas have the right to take away the original work so many people fell in love with in the first place? Indy survived a nuclear explosion – in a refrigerator! People swung around on vines like Tarzan! There were space aliens! Space aliens! The nuclear blast and refrigerator were the setup. The punchline arrived later, when Indy was told refrigerators could be death traps. What's wrong with a little Tarzan-style action in an action movie? Indy tried to do the same thing at the beginning of Raiders, for Pete's sake. Yeah. Aliens. Absolutely perfect when you consider the Indy timeline. KOTCS, which takes place in 1957, was released 19 years after The Last Crusade, which takes place in 1938. Historically speaking, 1957 was the 10th anniversary of the mysterious Roswell crash. Throw in killer red ants and KOTCS is every bit as much an affectionate look back on 1950s sci-fi flicks as Raiders was an homage to the 1930s serials. People who don't appreciate the boldness of the Indy series have no room to ever complain again about how sequels simply repeat themselves and offer up only more of the same. KOTCS should be lauded for taking Indy into a whole new world, a world of nuclear power and interdimensional travel. Read the complete theatrical review. If it still hasn't sunk in, read the Blu-ray review. If that doesn't work, then it's time to quote Roger Ebert on KOTCS: "I can say that if you liked the other Indiana Jones movies, you will like this one, and that if you did not, there is no talking to you." But, more importantly, there's Matt Anderson's own George Lucas rant from 2006. The opening credits are set against a clever piece of animation. There’s a young George Lucas, releasing THX-1138 to a limited audience. With American Graffiti, his fan base grows a bit. When Star Wars is released, his animated fans are legion, and they carry him away in triumph. Then, toward the end of the credits, there’s a refrigerator. Read the sidebar for more about this reference to Indiana Jones and the Kingdom of the Crystal Skull. But even prior to those credits, the movie starts with a snippet of Jon Stewart grilling Lucas on The Daily Show. Stewart railed against the faulty logic of the Sith not feeling the Skywalker family’s presence, even with the two Skywalker kids having been separated. Stewart showed quite a bit of Jedi savvy; Lucas seemed flabbergasted. Therein, though, is the crux of the matter: Lucas is essentially accountable to fans at all levels of society. They’re all over the planet. And many of them are mighty upset. The People vs. George Lucas was culled from some 630 hours of material submitted in response to an open call to fans worldwide. Japan, Germany, France, England; there’s a good representation of Star Wars’ global influence here. One particularly fastidious fan submitted 7.5 hours of content all by his lonesome. Before the obvious chant of “Get a life” begins, understand that The People vs. George Lucas is more than a look at the quirky nature of Star Wars fandom. This isn’t Trekkies: Episode Three. This is more like a therapy session for fans who feel burned by the creator of their obsession. 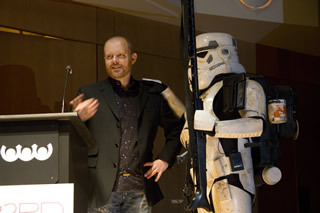 Adding legitimacy to the proceedings are interviews with Star Wars insiders and other creative types. Among them are Dale Pollock (George Lucas biographer), Gary Kurtz (producer of the original original trilogy), David Prowse (Darth Vader’s body), Joe Leydon (Variety film critic), Neil Gaiman (author of fantasies including Coraline and Mirrormask), Chris Strompolos (behind Raiders of the Lost Ark: The Adaptation, the now legendary homemade version of Raiders of the Lost Ark), and David Brin (author of The Postman, which was turned into a Kevin Costner flop). The documentary hits on a theme that is touched on by any number of filmmakers of a certain age: Star Wars inspired people to transcend being passive audience members and become filmmakers, become storytellers. Whether it’s by gussying up the family dog as Chewbacca or simply taking out the Super 8 and filming action figures frame by frame, Star Wars became a creative force previously unmatched. Why do so many of Lucas’ fans feel the need for therapy? Well, George claims he wasn’t happy with how the original trilogy turned out and, billions of dollars in revenue later, he started tinkering with the movies his fans adored. “Tinkered” might be the wrong word. “Meddled” is more fitting. The changes in Episodes IV-VI were all made by the same man who, back in 1988, warned that the colorization of black-and-white movies threatened to destroy America’s cultural history. What if Van Gogh wanted to paint his ear back on in a late-era self-portrait? What if Da Vinci figured he should touch up the Vitruvian Man? Would it have been any more legitimate if Alfred Hitchcock himself decided he should go back and colorize Psycho? Those are the kind of hypothetical questions that help put Lucas’ meddling in some perspective. As the documentary points out, the original Star Wars is on the National Film Registry. If Lucas destroyed his own work, as he preposterously claimed at one point the original negatives were altered while making the Special Editions, he should be held to some degree of cultural accountability. With any luck, this movie’s very existence might help Lucas see the light. As director Alexandre Philippe explained following a screening at the Starz Denver Film Festival, at one point Lucas’ people did request a screener of the documentary. But Philippe said no screeners would be made available to the press or anybody else. However, he would be happy to arrange a private screening. That was the end of that discussion. The People vs. George Lucas makes a strong case that Lucas has gone beyond merely being the victim of his own success. He hated the Hollywood system and having the people with money dictate how his movies would be made. He earned his creative independence with Star Wars but now he himself has become his very own establishment. That stance of complete and utter independence flies in the face of a crazy notion floated in The People vs. George Lucas. There’s the idea that, in this increasingly interactive age, creators will need to cede more control of their creation to the fans in order to survive. That’s an interesting idea, albeit also a scary one. That could be taking things a tad too far. The more important - and pressing - issue here is the seeming lack of respect Lucas has for his fandom, who simply want him to do right by them as trustee (and creator) of their favorite fantasy universe. His stubbornness regarding the fate of the original original trilogy is baffling. Other filmmakers have embraced the opportunity to present both old and new edits. Most notably, Terry Gilliam’s Criterion set of Brazil features three cuts. He hates one of them in particular, the “Love Conquers All” TV edition, but he uses it as a tool to show how editing can completely alter a movie and take it from one state with one message to a place totally unrelated. Ridley Scott, for one, has made something of a cottage industry out of offering various cuts. Blade Runner is the most prominent case, but there was certainly a considerable amount of legitimacy in Scott’s tinkering, which brought the film back to a previously well-documented state. Scott’s also offered up alternate cuts of Alien and more recent fare like Gladiator and Robin Hood. Salt, the recent action-thriller starring Angelina Jolie, will arrive on Blu-ray with the original theatrical cut and two alternate cuts. It’s a creative process. These alternate cuts aren’t surprising. What’s surprising is Lucas’ adamant denial of his original work. That’s a slap in the face to the Oscar-winning talent behind those movies that were the creative touchstone for so many filmmakers today. Given the more than 628 hours of material left on the cutting room floor, including the vast majority of a 4.5-hour interview with Dale Pollock, Philippe teased the festival attendees of a forthcoming The People vs. George Lucas: The Special Edition. Most certainly, though, this original, theatrical version of fandom therapy will survive in its current state and continue to serve as a catalyst for debate over creative boundaries for a long time to come.